EVGA GEFORCE GTX 680 Graphics Card in an Early 2008 Mac Pro--How fast is it? Yes, I am a gamer, a sucker for the latest and greatest first person shooter game and graphics card for the Mac. When the newest Call of Duty: Black Ops II came out last November, I immediately downloaded it to my Windows 7 Boot Camp partition. While the over 2-year-old AMD Radeon HD 5870 graphics card in my 2008 2.8GHz dual-quad Mac Pro ran all the previous Call of Duty games just fine at a resolution of 2560x1600 and moderate quality settings, Black Ops II was very sluggish and choppy. I had to drop the resolution down to 1600x900 and minimize all quality settings just to be competitive with a frame rate of only around 80 FPS. 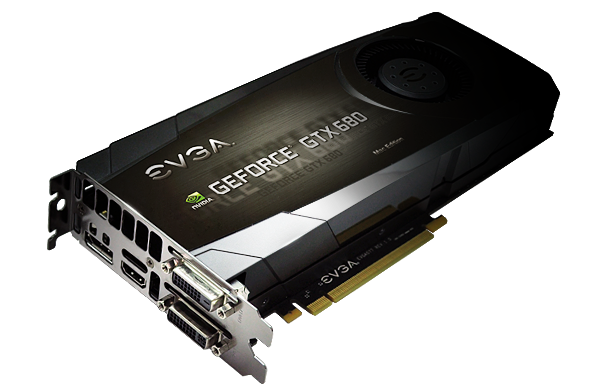 Fortunately, two weeks ago EVGA released its Nvidia-based GEFORCE GTX 680 Mac Edition for $599. By comparison, the main specs of the GTX 680 vs the 5870 are 2GB GDDR5 RAM vs 1GB and a 1006 MHz basic clock speed vs 800 MHz. I had thought about getting a Sapphire AMD Radeon HD 7950 for $479. I have generally preferred AMD (formerly ATI) graphics over roughly equivalent Nvidia graphics for gaming but the specs on the GTX 680 and the speed tests posted by Bare Feats, where the 7950 barely bested the older 5870, convinced me to shell out a bit more for the newer graphics card from EVGA. The GTX 680 is a shorter card than the 5870, lacking the brace that fits in the forward slot in my 2008 Mac Pro's PCIe card slot area. This made it a little more difficult on top of an already somewhat difficult job to get the card seated properly in its 16-lane slot, all done by feel. The GTX 680 has DisplayPort, HDMI, dual-link DVI-Digital and DVI-VGA video ports. Like the 5870, it uses two power connectors from the Mac Pro's motherboard. So how fast is it? I used two speed tests to compare the GTX 680 with the Radeon HD 5870: OpenGL Extensions Viewer's v2.1 spinning cube test and Unigine's Valley 1.0 Extreme Preset test. I picked them because both are available for Windows 7 as well as Mac OS X Mountain Lion so I ran each test three times using each operating system on my Mac Pro and averaged the very close results. Mostly, I use Windows 7 in Boot Camp to play games. The results are similar on both operating systems. Using these two benchmarks, the GTX 680 is much faster than the 5870. In addition, I have used the GTX 680 for over a week to play Black Ops II and with the same settings as the 5870, I routinely get FPS in the low-to-mid 100's, up to double that of the 5870. Previously, I always liked the colors better on an AMD Radeon than on an Nvidia GEFORCE. But the colors on the GTX 680 are just as vivid and don't completely wash out with the brightness turned up some on dark video games. Curiously my results for the GTX 680 are slower than obtained by Bare Feats in their Unigine Valley 1.0 Extreme preset tests-- 47 FPS vs my 44 (Windows) or 32 (Mac). But the 5870 results are the same--30 FPS vs my 31 (Windows) and 29 (Mac). This may reflect some differences between my 2008 Mac Pro and the 2010 model used by Bare Feats. Update [5-10-13]: Bare Feats confirmed my observation that the EVGA GTX 680 is slower in the 2008 Mac Pro (35 FPS) than in the 2009 (42 FPS) or 2010 (47 FPS) Mac Pros using Mac OS X 10.8.3. My results (32 FPS) are even slower than Bare Feats' results (35 FPS) which used a faster 3.0 GHz 8-core 2008 Mac Pro. Hopefully, this year Apple will will come out with the promised new and innovative Mac Pro as mine is starting to get long in the tooth. The EVGA GEFORCE GTX 680 Mac Edition breathes some useful gaming life into it for the time being.